Cross Threaded Bolt. The threads slided over on the wrong thread. Have you ever changed a tire puncture only to have problems with your wheel nut? The nut won’t come out from the stud, or you may encounter problems fastening it. Your wheel nut/stud could be suffering from cross threading. Cross threading occurs when the nut and stud threads do not mesh up together. A closer examination of threads will reveal some form of destruction. What is the cause of cross threading wheel nut? As a car owner, you need to differentiate between cross threading wheel nut and a stripped thread. The latter occurs when the threads on the nut or stud become damaged due to wear and tear or excessive tightening. With a stripped thread you notice that the threads have disappeared leaving the stud with a small surface area. The main cause for cross threading is when you try to fasten a nut at a wrong angle. You could be in a hurry to change your tire puncture that you fail to realign the nut to the studs. Instead of closely positioning the nut, people will force them on the studs. You will them have difficulty removing the nut. Another cause for cross threading is using the wrong nuts. Each stud requires a nut of a certain diameter. In this case, while your fastening angle is right, the threads do not match. If you continue forcing the nut to the stud, you will end up with damaged threads. The bolt and the nut can be made from different materials, and this means they exhibit different qualities. When you try to fix a bolt from soft materials, it could experience some cross threading – especially when over tightening it. When you are tightening the nut ensure that you use a wrench of the correct size. Cross threading of wheel nut can also result from nuts and studs that have not been changed for a long time. This causes them to rust, and the corrosive material glues them together making it hard to remove. To avoid cross threading wheel nut you will need to learn how to effectively change your punctured tire. The first thing you need before changing your tire is to place your car on a flat surface. This ensures that there is no undue pressure being applied to any of the tires. You should always use lubricant or oil on the threads to avoid cross threading. Check with the manufacturer to get the correct lubricant for the material on the bolt. Next place your emergency flashers to warn other motorists of mechanical problems. Ensure that you have engaged your hand brake. Put large stones beneath the other wheels to prevent the car from rolling in case the hand brake fails during a tire change. Your transmission should be at parking if automatic transmission. Take all the materials you will need, to change the tire from the trunk. This will include the spare tire and jack. Find the right spot to place the jack. Most cars have small notches for this. Lift the car with the jack, but it should not lift the wheel off the ground. 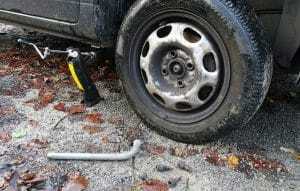 Begin by removing the wheel cap; use the cross wrench to loosen the nuts. Ensure that you are rotating the nuts and not the wheel. A good cross wrench perfectly fits in the nuts. To avoid cross threading wheel nut ensure that when you are putting the nuts back, you ensure that they closely align to the stud threads. The positioning is very important. Most of the cross threads are caused when replacing the nuts after tire puncture change. If the nuts are tight, you may need to use more force and risk damaged threads. Do not attempt to use all your body weight when turning hard nuts. Once you have loosened the nuts, use your jack to lift the car off the ground. Before you can remove even one nut ensure that the car is stable. You should use jack stands for added safety. Now you can remove the loose nuts one at a time. When all the nuts have been removed, you can then safely remove the punctured tire and replace it with the spare wheel. You can place the punctured tire under the car for added safety as you replace the tire. Align the wheel with the hub and start bolting the nuts with your hands until they are tight. Ensure that the nut is aligned to the studs to avoid cross threading. Use your wrench to further tighten the nuts. Do not use to much force as you can destabilize the jack. Use the jack to lower the car and further tighten the nuts but do not over tighten as this destroys the threads. Place your old tire in your truck and remember to repair it as soon as possible due to future punctures. 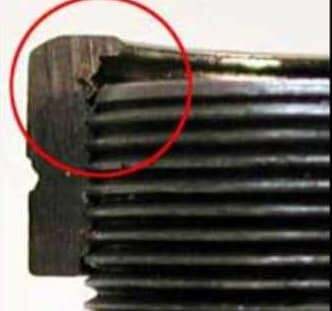 How do you restore damaged threads? A tool that comes in handy when repairing faulty threads is a rethreading kit. It can be used to restore old and rusty bolts. The first thing you will need to do is to reset the thread with a file. Have a ratchet to attach the socket which you should have matched with the cross threaded bolt’s head. to remove a part of it turn the bolt counterclockwise. Pour some cutting fluid on the damaged threads while identifying the matching diameter. You then need to turn the tap in a clockwise direction so that the damaged threads are restored. Cross threading wheel nut is a problem experienced by many motorists. The primary cause for cross threading is over tightening of the bolts to the studs during a tire change or misaligning the bolts to the studs. The result is that the bolt threads shift off center and cut into the female threads of the studs. Repairing of the threads is a challenge that can force you to replace the hub. Damaged nuts and studs can cause your wheel to come off during fast drives. Cross threading can also cause you problems when you are trying to change a tire in a hurry. If you use excessive force, you can cause further destruction of the threads. Learning how to change a tire effectively is a must for any motorist.